Uportal CMS is a surprisingly easy-to-use, yet powerful application to build and edit websites. Its intuitive interface will allow any authorized worker or staff member to keep their part of the website (marketing, HR, etc) up-to-date without having to understand HTML or knowing how to program. 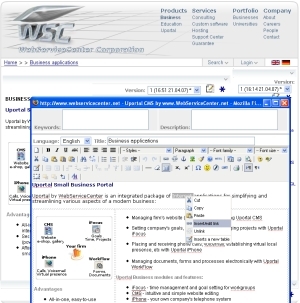 Anybody who can use a word processor (Microsoft Word, WordPerfect, etc) will be able to work with Uportal CMS, producing fast and professional-looking content.